Xpy is a small tool which disables the default threats of a Windows XP installation. Besides disabling Windows and some of its components to communicate with Microsoft servers, xpy improves privacy settings and your system's security. Features include: Disable Windows communicating with Microsoft. Disable questionable services. Tweak Internet Explorer and Windows Media Player. 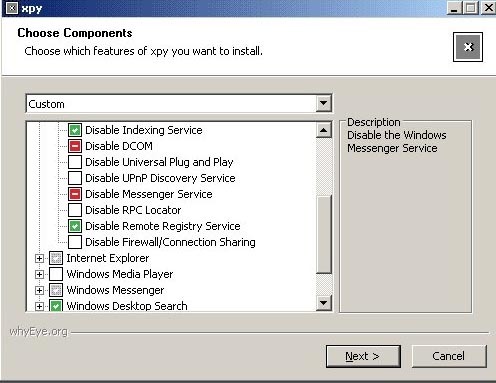 Remove Windows Messenger. Improve privacy and security, etc. Your antivirus software might report xpy as Spyware or a Trojan. xpy is written and compiled using NSIS, false positives are unfortunately quite common among NSIS compiled programs. If you have stumbled across this problem, please update your virus signatures first. If the problem persists, you can help by reporting a false positive to the manufacturer of your antivirus software. Qweas is providing links to XPY 1.2.5 as a courtesy, and makes no representations regarding XPY or any other applications or any information related thereto. Any questions, complaints or claims regarding this application XPY 1.2.5 must be directed to the appropriate software vendor. You may click the publisher link of XPY on the top of this page to get more details about the vendor.